With their variety of shapes, colors and tastes, heirloom tomatoes have become highly coveted by non-commercial chefs—when they can get them. Though availability can be an issue, when heirloom tomatoes are in stock, operators have found many ways to take advantage. 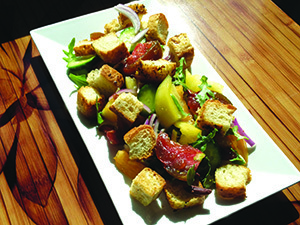 Scott Spiker, executive chef at The Erickson Alumni Center at West Virginia University, in Morgantown, says his department substitutes heirlooms for traditional tomatoes whenever and wherever they can, but finds that heirlooms do best in dishes that allow their flavor to shine through. Spiker favors Brandywine tomatoes because they remind him of the ones his grandparents grew in their garden. He’s used the variety in a traditional BLT, which he’ll amp up with fresh basil and a fried egg for a little extra flavor. The tomatoes also work in fresh tomato stacks, a simple dish of grill-marked heirloom tomatoes stacked with fresh mozzarella. One way to combat heirloom tomato availability is to grow your own. Kevin Klingensmith, executive chef for Parkhurst Dining at Reed Smith, in Pittsburgh, has planted six or seven types of heirloom tomatoes on the operation’s rooftop garden. At the University of California, Santa Cruz, Executive Chef Dwight Collins says his department is lucky to be close to the world’s largest hydroponic farm, which keeps him stocked with heirloom tomatoes. The department hopes to have them year-round, but for now the team takes great care to showcase the tomatoes when they do have them available. Other fun dishes Collins’ department has dished up with the heirloom tomatoes include a ratatouille-stuffed tomato, which featured eggplant, onion, mushrooms, zucchini and a little cheese, and a rustic heirloom tomato soup, which featured larger chunks of tomatoes with their skins, basil, a little cream, Parmesan cheese and onion. Beyond putting them on salad bars, it’s often tough for schools to get creative with heirloom tomatoes. But Keith Haigh, foodservice director with NutriServe at Haddonfield Public Schools, in New Jersey, says there have been a few chances to have some fun with different heirloom varieties. “The middle school and the high school are no longer in the school nutrition program, which allows us to be a little more creative with our dishes,” Haigh says. One example was a salsa that was made featuring multicolored heirloom tomatoes, which were served with a soft taco made of battered rockfish and shredded lettuce. In addition to the tomatoes, the salsa included lime juice, red onion, a touch of garlic, sea salt and cracked black pepper. “You got the tartness of the lime juice, the sweetness of the tomatoes and the saltiness of the fish and it really just was incredible,” he adds.